The work-in-progress dialog box that a user was able to bring up. Google first brought the ability to run Android apps on Chrome OS with a project called the "App Runtime for Chrome (ARC)." Google built an Android runtime on Chrome OS and partnered with select developers to port a handful of Android apps. Now it sounds like Google is ready to unleash millions of Android apps onto the platform by bringing the entire Play Store to Chrome OS. In the Chrome OS subreddit, users are reporting some interesting behavior in their Chromebooks. "TheWiseYoda" noticed that when the settings first load up, an option flashes on screen that reads, "Enable Android apps to run on your Chromebook." The option immediately disappears, so it's not possible to click on its confirmation box. We were able to replicate this on our second-gen Chromebook Pixel running the developer build. Choose from over a million apps and games on Google Play to install and use on your <ph name="DEVICE_TYPE">$1<ex>Chromebook</ex></ph>. The message name "ARC OPT IN" points to this being a huge expansion of the App Runtime for Chrome project. ARC took a big step a year ago when it added support for Google Play Services, and now it seems Google is really going to open the floodgates for "over a million" apps. Another user by the name of "InauspiciousPagan" was able to bring up a user-facing dialog box describing the new feature. 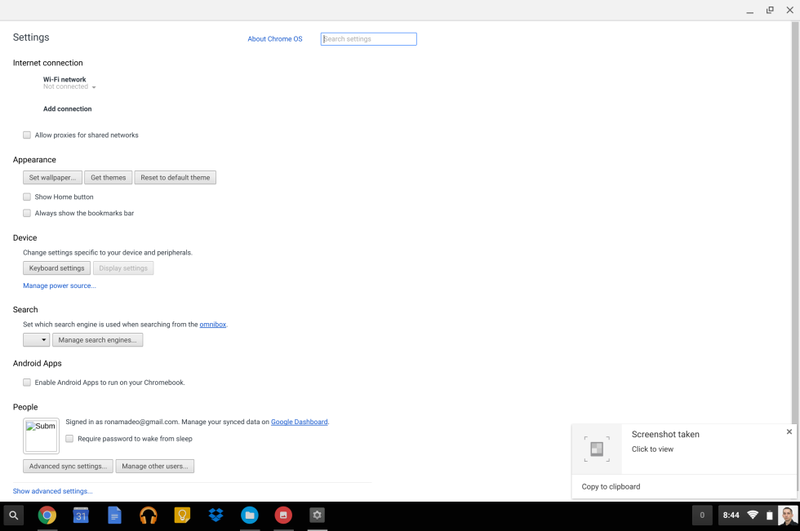 The checkbox option will be a relief to some Chrome OS administrators. Since running Android apps is a checkbox in the settings and not an included-by-default feature, administrators will be able to lock down the settings app and stop users from enabling the feature. This way security-focused shops can guarantee a barebones Chrome OS build without exposing themselves to all the extra vulnerabilities and surface area of Android app compatibility. Regular consumers, on the other hand, would have only a checkbox standing between them and a copy of Flappy Bird. 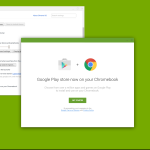 If Google Play does arrive on Chrome OS, does this mean the Chrome Web Store's days are numbered? Feature development on the Chrome Store was pretty much abandoned a few years ago, allowing the Play Store to blaze past it. The Chrome Store doesn't accept Google Play credits, and it has no prepaid gift cards sold in stores. Google Play supports A/B testing for listing, app analytics, developer replies, and lots of other features that make developers' lives easier. The Play Store's reach is much wider, too: Google Play supports payments in 136 countries, but the Chrome Web Store only takes payments in 36 countries. 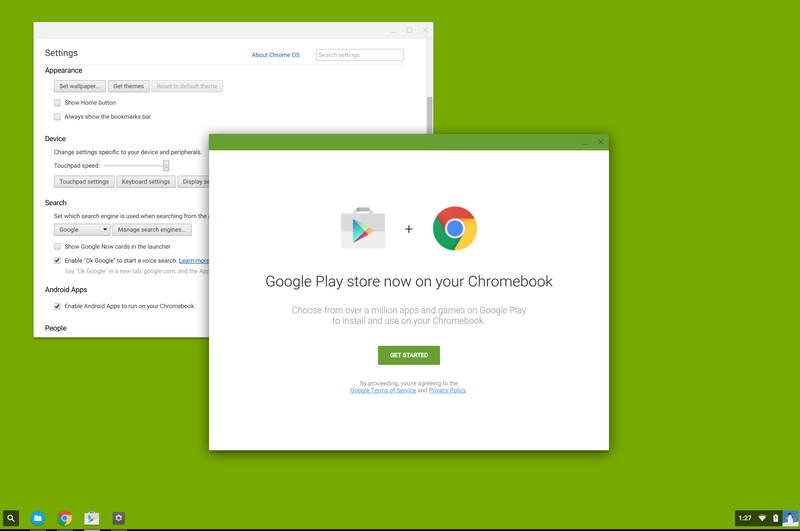 If you use Google Play for Education, the Play Store even supports Chrome Apps. All that's missing are Chrome extensions and themes. 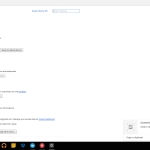 Upgrading to the Play Store would be a big improvement for Chrome OS users. We haven't heard any official news about Google Play coming to Chrome OS, but Google I/O is right around the corner.